Scholarships, they’re great because hey – money to pay for college! There’s a lot of information to keep track of and it’s difficult to stay on top of it all. Well, it turns out, you can drastically simplify the scholarship application process when you’re organized. In today’s post I’m going to show you how to make organizing and tracking college scholarships easy. Getting organized and staying organized is empowering, and for a number of reasons. things that are organized just look better! Being organized saves you time. 1 ) Spend a whole day figuring out what still needs to be done for a scholarship application, where to send it and if its even worth because you forgot the due date was tomorrow. 2 ) Or, spend a little extra time upfront writing down all the pertinent information when you first decide you want to apply for a scholarship. Personally, I’d choose option two. It sounds a lot less stressful. And as a college (or high school) student, you can definitely use less stress in your life. And I have a solution that will do just that. 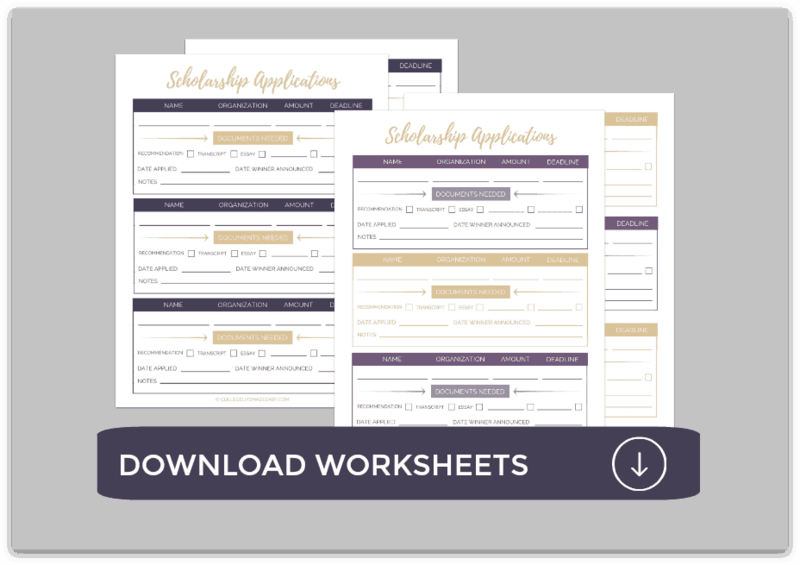 Let me introduce you to my Scholarship Application Tracker Worksheets. I’ve already done all the hard work for you. You don’t need spend time deciding what you should write down about each application or even thinking of a way to write it so it’s easy to reference later on. With my Scholarship Trackers Sheets, all that has been carefully thought of and executed in the design. All you need to do is fill in the blanks each time you start apply for a new scholarship. So, what will these forms keep track of? There is space for all the crucial information you’ll want to know about a scholarship. The worksheets are broken down into three, neat boxes per page so it’s quick and easy to separate what you’re tracking for each scholarship. After that you have the documents needed. Most scholarship applications need a letter of recommendation, a transcript of your grades/GPA and an essay. Others will require extra items, so I have left a few blank spaces that you can fill in. There are check boxes next to each needed document. Once you have secured that document – check it off! This way you will be 100% sure that you have it and you can see what you still need to get. There are just a few more bits of information you’ll want to have handy. First that’s the date you turned in your application – again, something to give complete confidence that you did turn it in. And second, the date that the winner is announced. Some scholarships contact the winner, but not always. That’s why you’ll want to know when the money is awarded – so you can check to see if it was you! 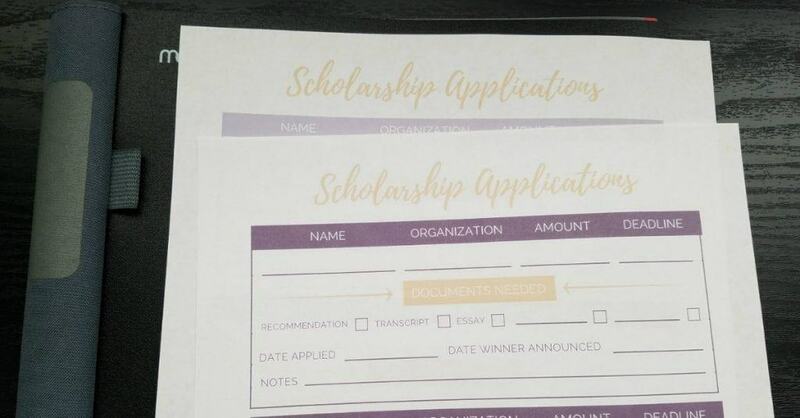 There are a few lines at the bottom of each box, where you can jot down any extra notes you want to remember about a scholarship application. My Scholarship Application Tracker Worksheets are the ultimate scholarship application organizers. Each box is succinct, yet packed with useful information. Now that you know all about them, it’s time for you to take action. The Scholarship Application Trackers are available in my Resource Library. To gain access to them (and over 15 other free printables) you’ll need to password for the library. You can get that password, and instant access to those worksheets, sent to you when you enter your email here or by clicking on the image below. There are 6 different designs to choose from, because after all it’s more fun to be organized when the worksheet is visually pleasing. You can print and use all the resources in that library for free! 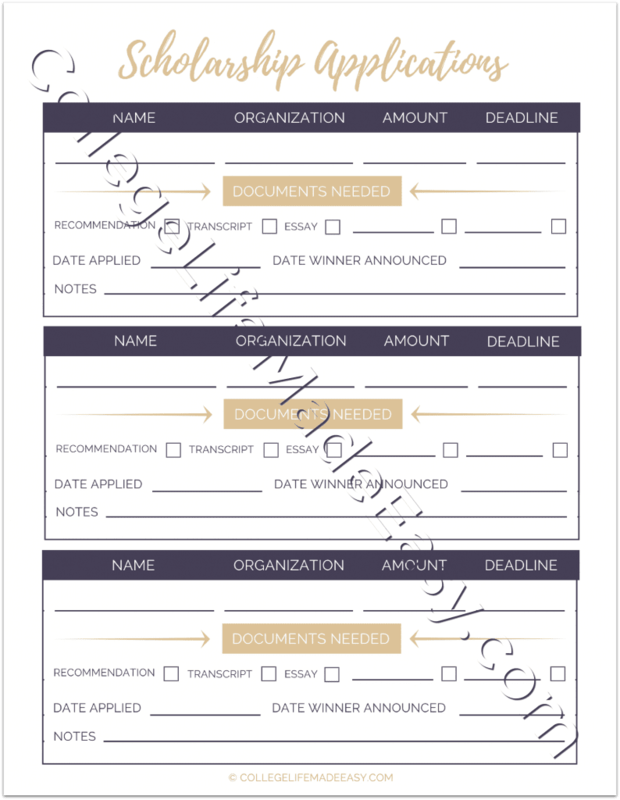 Printing out a Scholarship Application Template is the first step towards making your life more organized. It’s also the first step towards possibly scoring money for college! And, who doesn’t want that? Leave a comment below to let me know which Scholarship Application Tracker Worksheet design you like best.